Things are heating up in Houston, especially now that springtime is officially here and summer is quickly approaching. We all love spending time outdoors when the sun is shining and the days grow longer, but you might have collected dust and leaves on your outdoor patio during the cold winter months. Now is as great of a time as any to transform your outdoor space into a summer getaway, which is easy with a few spring cleaning tasks and maintenance touch-ups. Adding functional and beautiful exterior lighting solutions is a great way to spruce up your outdoor patio. At M&M Lighting in Houston, Texas, we offer many different types of outdoor lighting options, ranging from decorative wall mounts to sconces and outdoor chandeliers. Our team of lighting experts can help you find the perfect outdoor lighting solution for your outdoor space to turn it into your dream patio. Contact us today. 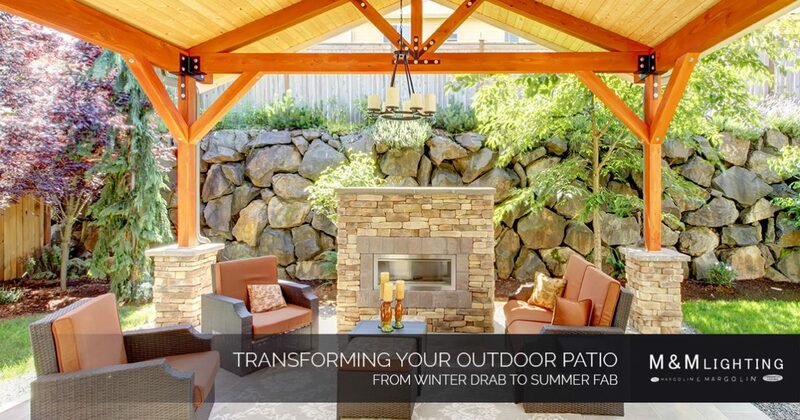 In this blog post, we’ll go over several ways you can turn your outdoor patio from winter drab to summer fab, including lighting design options that will add functionality and flair to create a relaxing and inviting ambiance during the summertime. We understand that this first step isn’t the most fun part of the process, but it is absolutely necessary to creating an outdoor space that impresses your guests. Bust out your broom and cleaning supplies and get into your spring cleaning mode! Sweep any leaves or debris from your patio and wipe down your outdoor furniture. We also suggest cleaning your gutters and floor area (if it’s waterproof, of course) with your garden hose to speed up the process. Plants are a phenomenal way to breathe life into any space inside (or outside) of your home. They can add personality and natural beauty for an effortless final touch to your patio. Flowers are a go-to for most homeowners because they add color and smell great! But if you have allergies or want to stay on the simple side of decoration, you can spruce up your patio with basic succulents (especially if you don’t have the most spectacular green thumb) or other plant types. Outdoor furniture will be the primary focus of your outdoor patio, which is why this is the time to upgrade your outdated furniture or pick out your first selection of outdoor tables, chairs and sofas. Make sure you choose furniture that is UV resistant as well as waterproof so you won’t have to replace it very often. Choose colors that blend well with your landscaping, exterior home design and planned (or already installed) lighting fixtures. Our favorite part: Install outdoor lighting that matches your patio’s design style. Whether you’re looking for wall mounts or want to add a unique hanging light above your patio area, there are a lot of creative and innovative ways to add exterior lighting to your outdoor patio. It’s important not to get too random with your outdoor lighting solution because you don’t want the space to feel like a Broadway stage while you’re relaxing with friends and family during Houston’s warm summer nights. Be strategic with the fixtures you choose and ensure they complement your home and landscaping design. Also, make sure they provide security and functional lighting to the space when the sun goes down and they’re your only sources of lighting. Evaluate your outdoor patio and determine the best exterior lighting solution that will create the atmosphere you desire for the space. From there, our lighting specialists at M&M Lighting can help you find the best outdoor lights that will fit your style and budget. We’ve served the Houston area and surrounding communities for more than 50 years, and we take pride in connecting our customers with high-quality interior and exterior lighting options. Whether you’re installing exterior lighting for the first time or you’re simply upgrading, we are here to help you create the outdoor patio of your dreams. Choose us to help you tackle your next home lighting project. For more information, call us at (713) 469-3002 or visit our Houston showroom today!